We made it home yesterday and survived our first night with the girls. Their personalities are shining through as Addy likes her space and Lilly just wants to be cuddled and held most of the time. They are eating well and we are trying to keep them on the same schedule which sometimes proves easier said than done. The picture above was taken as the girls were getting re-aquainted. It was one of those moments where you wish you could tell what they were thinking. Anyway, gotta go, it's almost time for bottle duty. Okay, so the girls have had it, they heard there is a whole other world outside the NICU and they are ready for it! All preemies have to pass a car seat test, which means they hook up to monitors and have to sit in their seats for an hour without obstructing an airway to ensure that they can travel home safely. As you can see our girls are ready for their road trip! The feeding tubes are out, their vaccines were given and the car seat test was passed and we are ready--tomorrow looks like it will be the day! 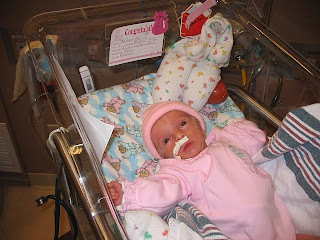 That means they will have spent 13 days in the NICU, a picture of their home away from home is below. The nurses have been so good to us and we learned a lot about caring for preemies. Again, it will be a month or so before we can really show them off, so be patient, we know lots of people want to visit--but we are going to be overprotective, we've been through too much to let them get sick now! I thought I'd write as Jeremy and I are posted up at the hospital, both of us on our laptops, him doing work and me blogging.... 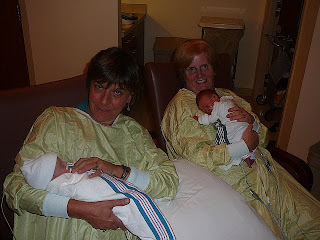 They kick us out of the NICU between feedings, because they believe in "clustered care." This means that every 3 hours, we get to take their temperatures, change their diapers and feed. It takes about an hour to do this, then we have about 2 hours to kill and they kick us out because in that 2 hours, the girls are supposed to be unstimulated, resting and growing. The pictures above are the girls having some grandma time, then Lilly sleeping and Addy wide awake. 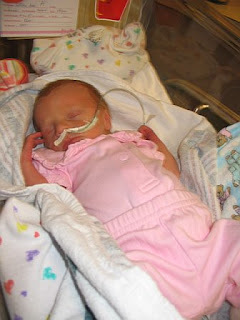 Believe it or not, their outfits are preemie size, and still are so big, but we are having fun playing dress up! So, what are we waiting on to take them home? The bottom line is that we need to get the feeding tubes out. Right now, they are both about 50/50, they'll take about half of their feedings entirely by bottle, then the other half the time, they'll take most and have to use the tubes to get the rest. All of their food is so important, that until they eat consistently, we can't take them home for fear that they would lose weight. 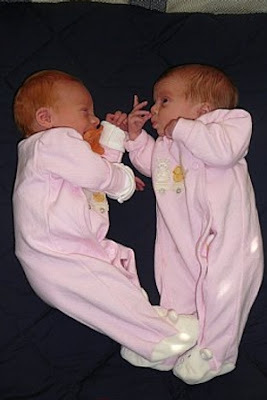 Both lost about 10 % of their birth weight, which is typical and now they are putting it back on. Addy got as little as 4 pounds, while Lilly's lowest was 4.6. Anyway, that is our news, once they feed consistently, they'll come home, but no doctor will give us an estimate of when that will be, so we continue to spend A LOT of time at the hospital. Please keep us in your thoughts & prayers! Here are a few pics--we are doing well, each day is an adventure and there is still some quality time left to be spent in the NICU. Here are some pics without feeding tubes (they went back in, but were out for a while). The rosy cheeks on Addy are from the tape from the tubes. Jeremy called them our little bobble head dolls today. They are so funny and we love spending time with them, but days at the hospital are exhausting. We decided it was like we are both recovering from a week long hangover without ever having the party before. We know it is just to prepare us for the tornado after we bring them home. Thanks for well wishes--sorry we can't return all the phone calls & e-mails, time is precious and we are trying to spend as much time with the girls as possible. Of course we are a little biased, but seriously, aren't they beautiful? The feeding tubes will come out as soon as they feed on their own, but they don't need oxygen or antibiotics for infections at this point, so life is good for Addy & Lilly despite making their grand entrance over 6 weeks early. They are definately fraternal, as Lilly is a little chubbier than her sister and has her mom's hair for now. Addy is a brunette for now. Both have brown eyes. Lilly thinks she's a supermodel and loves having her picture taken while we have to work with Addy because she puts her hand up and has no interest in the paparazzi. Thanks for the kind thoughts, prayers & wishes. Please note that we are doing everything we can to keep the girls in good health with weakened immune systems and for now this means they can't have visitors, this could go on for some time, both at the hospital and at home, please be patient, we certainly don't want to offend anyone! We promise, when you do get to meet them or hold them, they are worth the wait! 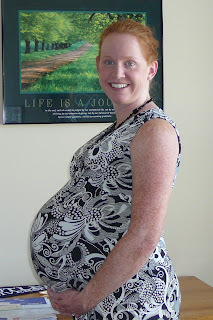 Okay, so there isn't much pretty about 33 weeks, it is exhausting just to get showered. The picture conveniently cuts off the calf and feet swelling that has been taken to a whole other level this week and there are very few clothes that still fit me. This week did bring just a little excitement as we made our first trip to Labor & Delivery on Friday, no we didn't think they were coming, but that darn blood pressure had creeped up again and they wanted to have me monitered. It was a 4 hour adventure after which I rewarded myself and the girls with Chic-fil-a. Another milestone this week--we bought the twinmobile. It is a Honda Pilot and surprisingly once we geared up to pull the trigger we did it in 1 day. Now we have a car to bring them home in! Dad turned 28 on Sunday, so he was glad they didn't come too early as he didn't want to share his birthday. Mom's instinct is that they are coming sooner rather than later as one has positioned herself so low, it is painful to sit in certain positions. There is a new moon this weekend, so my secretary seems to think it might happen then...if you have any bets on dates between now and September 7th (which would be my 38th week and the doctor said he wouldn't let me go past that), please post.